Humphrey Munson kitchens are well known for their classic kitchen designs that have a smooth, contemporary edge. Of course, they also design and manufacture furniture for other rooms … dining tables, living room cabinetry, boot and utility room storage. The outdoor Markham kitchen is a new addition to their portfolio. Creative Director Louisa Eggleston outlined the project for us. Q: What was the brief for this stunning project? The outdoor Markham kitchen was designed by Peter Humphrey, Design Director and Founder of Humphrey Munson. It was the finishing touch for a just-completed refurbished home, with landscaped garden and pool area. We had designed, manufactured and installed the kitchen, the utility/boot room, and supplied a bespoke dining table and sitting room cabinetry. We were asked to create an outdoor kitchen space, using our hand-crafted traditional joinery techniques. Q: As it’s an outdoor project, how did you change your approach to the choice of materials? The kitchen is positioned beneath a permanent timber gazebo. We used iroko, which is a super-hardwearing timber, and finished it with stainless steel hardware to ensure the longevity of the Markham design cabinetry. It suits the formal design of the country garden, and emphasises the balance of simplicity, scale and proportion which are the underlying design principles of each and every Humphrey Munson kitchen. We used an L-shaped configuration, and made sure all the key spaces and requirements were perfectly zoned. The layout needed to allocate spaces for food prep, cooking and grilling, and of course, for clearing away. The right-hand side of the kitchen is the cooking run, which features the 107cm wide Wolf outdoor gas grilling station. It’s a luxurious choice, Wolf have taken outdoor cooking to the next level with this behemoth of a barbecue! And of course, it’s not just a ‘grill’, it includes a searing zone and infra-red rotisserie spit as standard. Q: There are some very practical ideas here, which will help to keep the cooking area neat and organised! What do you think works really well? Positioning a pull-out bin beneath the counter, to the left of the grill makes it easy to keep the cooking zone clean and tidy. There are two compartments, food waste and recycling. There’s also a space for the LPG gas canister, which can be hidden out of view. We’re pleased that the necessary details are included but not on display – it keeps the overall look and feel very clear and uncluttered. Yes, it was. The left-hand side of the kitchen provides plenty of space for the main food preparation area (all those salads to chop! ), and we included a black granite upstand to separate it from the raised bar. It’s a great spot for guests to sit and relax with a drink before dinner. There’s also an integrated stainless steel sink, and of course, an under-counter fridge to keep bottles chilled and ice-cubes handy. Q: Are outdoor kitchen spaces becoming more popular? Q: What is your best advice for a successful outdoor kitchen? 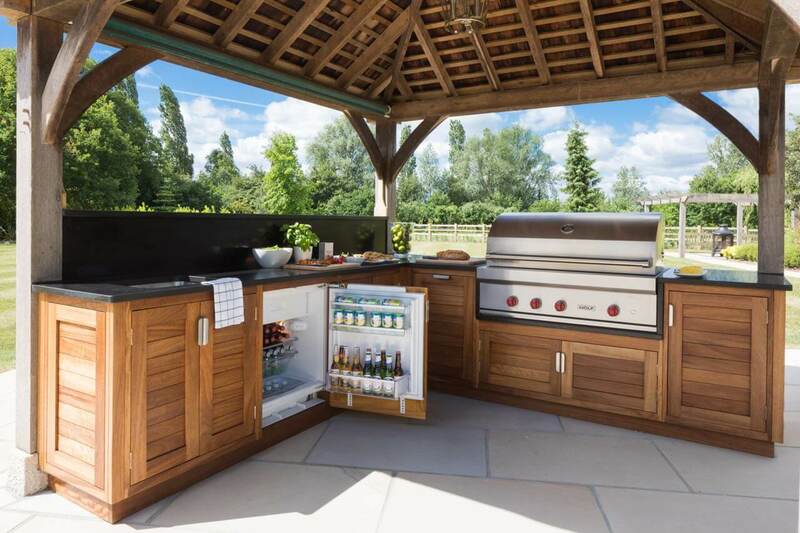 Just like the indoor kitchen, the key to a successful outdoor kitchen design is the zoning of the space – think about all the usual things like food prep, cooking and clearing away and make provision for those activities accordingly. In terms of the actual positioning of the kitchen think about the sun and where it is during the afternoons and early evening which will be the time this outdoor kitchen is most in use. A timber gazebo will provide shelter from the direct sunlight and protection from the elements during the winter months. Stone flooring that can withstand a few spills here and there is essential, and always incorporate a seating area than can be scaled up or down according to your entertaining needs. WE LOVE: Everything about this design, from concept to layout to materials. What’s not to love about an outdoor kitchen! Wolf outdoor gas grill ICBOG42, 107cm w in stainless steel with red knobs, £6,804. Canvas cover, griddle plate, bbq tools also available. See the collection here. Photography by Paul Craig, contact him here.